Basically, I have been thinking about an idea for what to give Mordor for walls and wall hubs without mimicking the SEE mod of old. And frankly, I arrived at the following. Volcanic Hub: A volcano roughly the size and shape of a wall hub, builds Volcanic Walls. Volcanic Wall: A volcano roughly the height and thickness of a wall, can be upgraded in many ways. Volcanic Pillar: A volcano roughly the size and shape of a battle tower, spits out streams of lava the size of arrows. Black Gate: A clone of the Dol Guldur Central Gate from the Dol Guldur Map, opens the way the Isengard wall gate does. And, anything Volcanic can dump lava on enemies the way the Magma Cauldrons upgrade does. So, that's what you can expect me to do for Mordor Walls in any mod of mine. Thoughts? I love the concept and I'm still waiting to see any models from you. You have posted in the Showcase forum and I was excited to see some models when I saw this topic. One issue that I find is that Volcanos don't usually create wall shaped structures, perhaps a better approach would be a fissure. 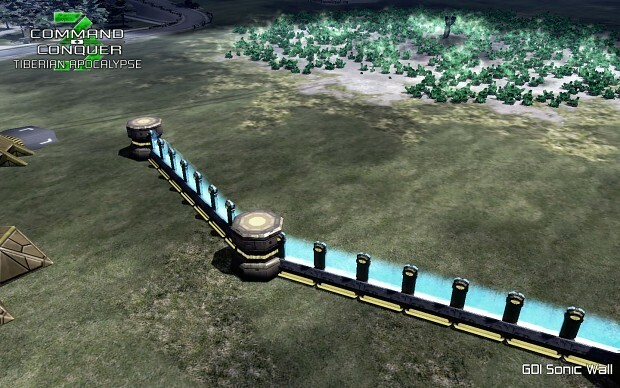 Using a very low wall model, and a lava fx in a similar implimentation to this GDI Sonic Wall from Tiberium Apocalypse. It wouldn't be too different to the lava moat upgrade of the Mordor fortress. The Special Extended Edition uses the vanilla Dol Guldur models and concept for their Mordor Walls. Now that we have seen Dol Guldur as designed by WETA Workshop in The Hobbit, as a ruined stoney place with the metal beams holding it all together, BfME 2's design is outdated. BfME 2's design works perfectly for Barad-dur, and the general concept and plan in AotR is to use the Dol Guldur assets in Barad-dur and creating some of our own assets for Dol Guldur (in terms of mapping at least). Thanks, Matt. And now that I have Parallels with Windows 10 on my MacBook Pro, I can make models and showcase them here wherever I go! I have work 9 to 4 today but I have tomorrow off, so I'll make models after work tonight and most of the day tomorrow and showcase them here tomorrow, sound legit?